The first step is to think about the flowers you’ll carry. A large rose bouquet, for instance, which will need help keeping its shape, should be wired and wrapped with floral tape. It will then require a full wrapping of ribbon or fabric to hide the hardware underneath. Even if you are carrying a delicate bunch of posies, it’s a good idea to wrap the stems with floral tape first so they won’t stain the ribbon. Long, elegant stems, such as tulips, calla lilies, or sweet peas require only a simple wrappings, like a single band of ribbon fastened with a button or decorative pins. 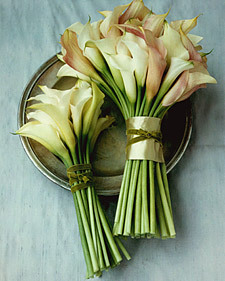 Exposed stems should be trimmed neatly with a sharp knife so they look fresh when you carry them down the aisle. What wrapping should you use? You might try a piece of fabric from your own gown or your bridesmaids’ dresses, an antique handkerchief for “something old,” or browse at a fabric store for the prettiest ribbons you can find. Look for dressings and trimmings that match your color scheme, or select ones that will make a statement all their own. 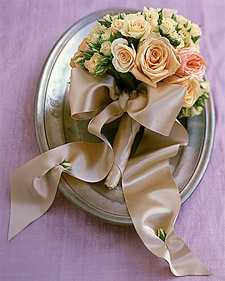 Classic: A tight dome of roses is made even more beautiful when finished with an opulent satin ribbon and bow. A few more buds are sewn in the trailing ribbon ends. Click here to see how it’s done! 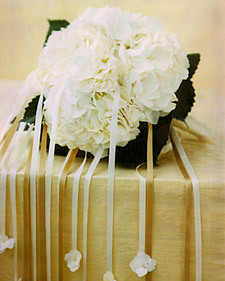 Exposed Stems: After taping stems just below the blooms, a length of ribbon is wrapped around the stems and finished with a crisscross of thinner velvet ribbon, secure with pin. See how it’s done here! Square end: Stems are completely wrapped in textured, patterned, or beaded fabrics, and embellished with ribbons and rosettes. To see how it’s done, click here! Fabric Collar: Using a beautiful handkerchief or napkin to wrap your wedding bouquet gives you a chance to show off a sentimental heirloom. The stitching is easily removed, and a solid wrapping of floral tape protects fabric from stains. See how it’s done here! 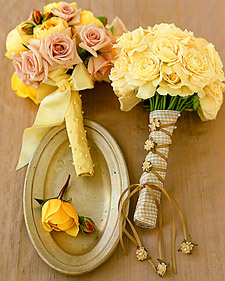 Streamers: Use left-over florets from your bouquet to decorate a short-stemmed bunch of flowers. See how it’s done here! 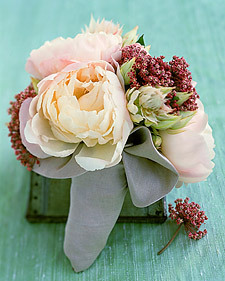 Ruffle Cuff: When you’re dressed in the most beautiful fabrics on earth, your bouquet should be, too. 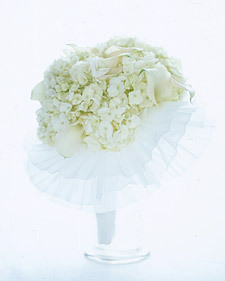 White calla lilies and hydrangeas cluster atop three frothy layers of pleated white silk organza. Click here for details! 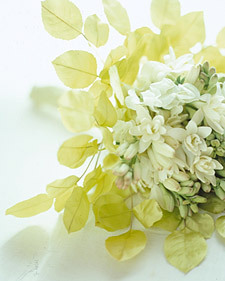 Leaf Cuff: Pale-green silk leaves lend an ethereal quality to a bouquet of fragrant white tuberoses and sweet peas. 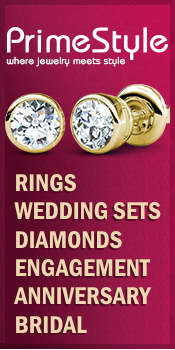 As you proceed down the aisle, the bouquet will appear to float, gently anchored by your grasp. See how it’s done here! Button Cuff: This bejeweled bouquet gets its shimmer from layers of mother-of-pearl buttons. 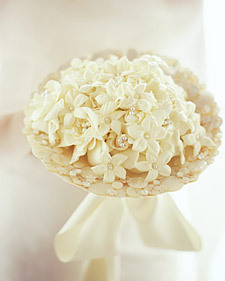 Pearl pins give a soft glow to bunches of gardenias and stephanotis, which are tied beneath the cuff with an ivory bow. Click here to see how it’s done! Artfully arched: The arched contour of this arrangement is achieved by wiring both flowers and berries. 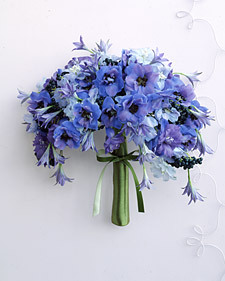 Jewel-tone viburnum berries accentuate the fluttery lightness of the purple hybrid delphiniums, as slender brodiaea blooms hang from the bouquet’s edges. A vintage green satin ribbon adds a finishing touch. See how it’s done here! Hand-wired cuff: A coiled bouquet cuff is a lighthearted accent: Wire wrapped in pale-pink ribbon was shaped into a looped design and attached to the stem to frame the bouquet. 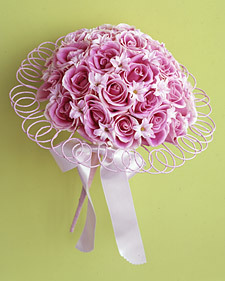 Matching satin ribbon is wound around the wire stems and tied in a graceful bow. Click here to see how it’s done! i was just wanting to know what type of flowers were in the first picture. Ive been trying to find green flowers for a while. ANy help is much appreciated.